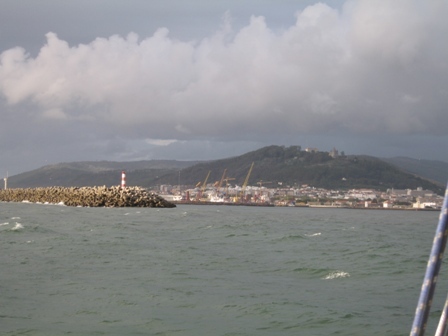 Coming into sea to Viano do Castelo, Portugal. This was the least expensive marina we had been to so far, only costing us 11€ (euros). It wasn't the most salubrious marina but the management was very nice and the marina was easy to get in and out of. 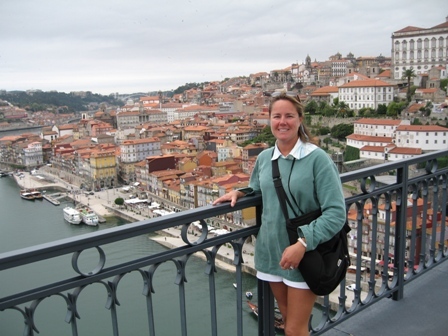 We had left Bayona, Spain at 1200 noon and arrived in Viana do Castelo, Portugal at 7:30pm. 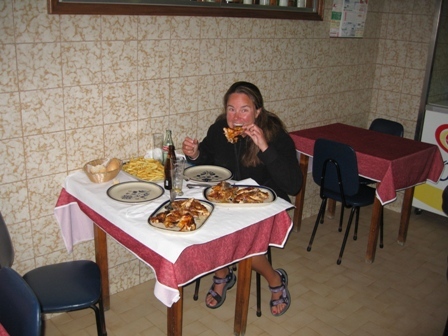 We chose to go to Viana do Castelo because our friends said we must go there and have the Frango de Churrasco otherwise known as "Flat Chicken". Marco and I were thinking of this chicken all day long and we were absolutely starved when we reached the port. We checked into customs and then set off for dinner. We found this great little place in the center of the old part of town and feasted. We actually pigged out and we each ate a whole chicken and a very large platter of fries. The chicken is cut in such a fashion that it one whole piece of chicken but flat. It is then roasted over a coal fire and basted in a sauce that has garlic, white wine, paprika, salt and hot peppers. After dinner we took a long walk through town. 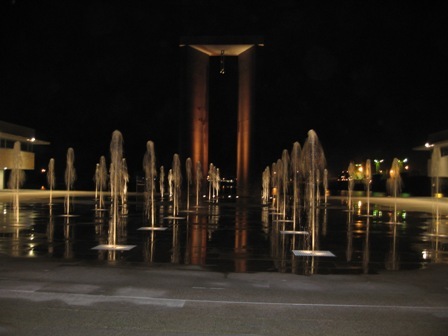 This was a beautiful fountain that was lit up and the streams of water changed different patterns. 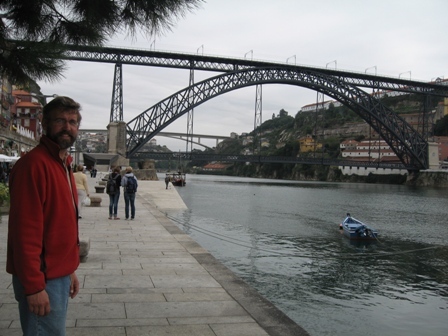 We arrived in Leixoes on October 4th, 2006 as the harbor was known to be secure with all weather access and easy public transportation to Porto. 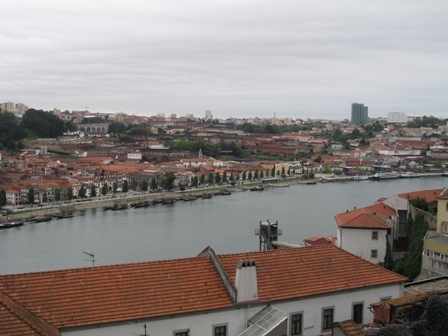 Porto itself has little in the way of cruising boat facilities, and the river Douro entrance can apparently be dangerous, Leixoes was pretty ideal to explore this area of Portugal. Once again we also ran into some familiar boats here, and ended up being moored next to Lahaina from Holland, whom we had met in La Coruna, and also near Dingo, and Hafskip. 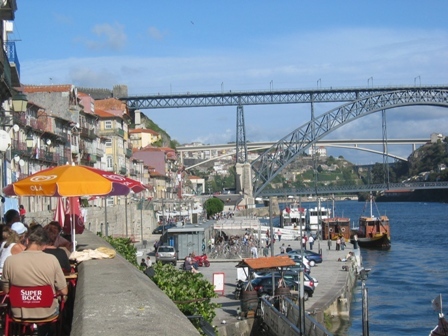 Porto is the second largest city of Portugal and has been an important trade center since the Romans build a fort there. The city initially profited from provisioning crusaders, followed by the maritime discoveries, the spice trade and later the wine trade with Britain. This commerce has contributed greatly to the wealth of the city over the centuries. The main port houses are all represented along the river bank of the Douro, where the grapes were transported to by boats from the vineyards inland. 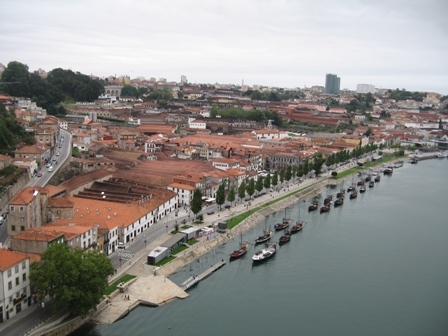 Interestingly, the port houses are located across the river from Porto itself, due to a dispute about the shipping tolls between Alfonso III and the Bishop of Oporto in 1253. Looking south along the bank of the Douro with the many port houses in Vila Nova de Gaia, across from Porto. Ponte de Dom Luis I build in 1886 by an assistant of Gustave Eiffel. 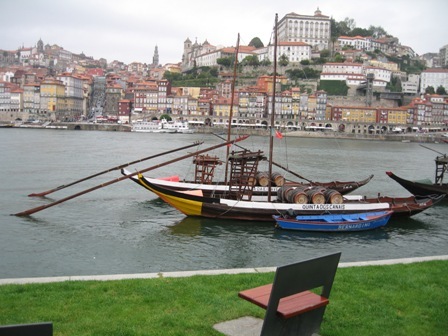 Prince Henry the Navigator was born along the bank of the Douro in Porto. 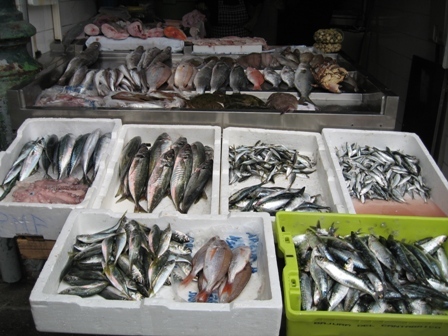 The Bolhão market with great assortment of fresh fish and vegetables in the heart of Porto. Igreja do Carmo constructed by Jose Figueiredo in 1750 in Portuguese Baroque style. 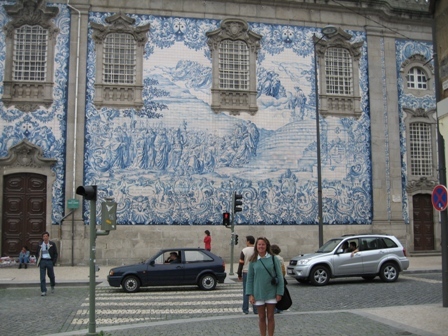 The enormous azulejo panel on the side depicts the founding of the Carmelite order on Mount Carmel. Spain and Portugal have many dogs around that roam the streets. So where there are dogs, you often find evidence that they have been there. Marco, being the good guys that he, is was always pushing me out of the way when we would walk so that I wouldn't step in dog poop. After a month or so of this occurring I started to get a little fed up and I told Marco to "please stop it, I can watch out for poop myself". 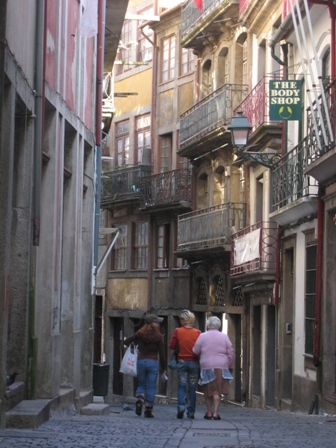 Well, later that same day in Porto, Marco and I were walking down this alley and don't you know it he pushed me again. I was about to blow until Marco quickly explained that he wasn't saving me from dog poop but from the dog that was peeing over a balcony that I was just about to walk underneath. To this day I have no more objections to Marco pushing me. 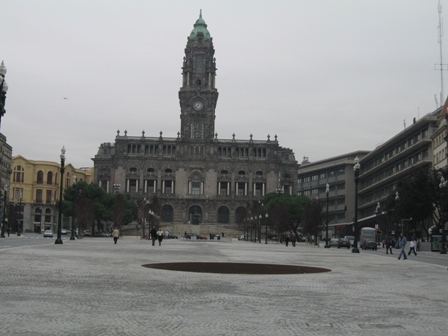 The Câmara Municipal at the head of the Avenida dos Aliados, which is a wide double avenue with the main banks and offices. 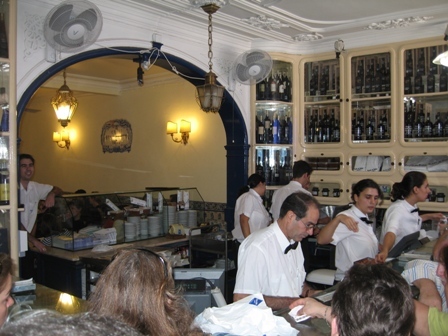 Cafes dot the Porto shoreline of the river Douro. 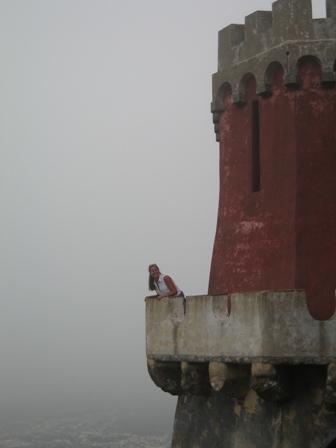 Marco and I actually went into Porto twice. The second day we bought some news papers ( difficult to find in English) and had lunch then drinks at two different cafés. This one was very beautiful!! 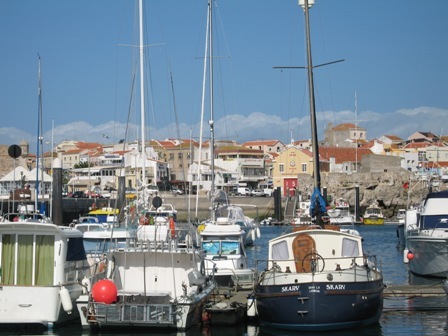 After an overnight sail we arrived in Peniche, located on one of the few peninsulas of the Portuguese west coast, and partially surrounded by 16th century walls. 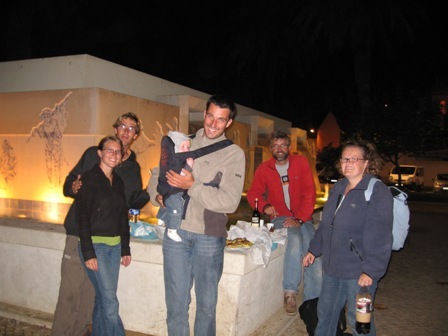 The town is thought to have been originally settled by the Phoenicians. Until the 15 century the town was actually an island with protective walls also running along the shore side. It was the site of a British landing in 1589. 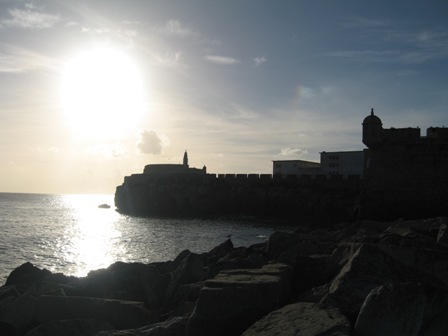 At the entrance of the town's harbor is the prominent 16th century Fortaleza used as a prison during the Salazar regime. 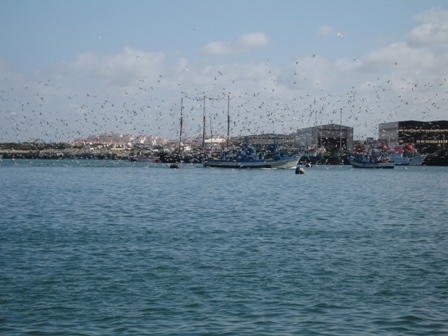 The town of Peniche has an active fishing fleet, with a siren sounding the arrival of fish laden boats to start the fish auction at all hours of the day and night. Fortunately the sirens rarely sounded after midnight. It appears that the birds are also conditioned by the sirens, as the boats are greeted by a tornado sized flock of Pavlovian gulls. Marina based view of the town of Peniche with mostly local boats and a few cruisers along the outside dock. 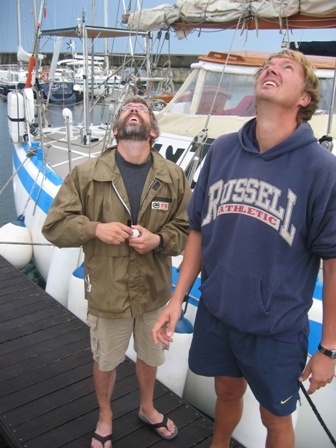 In Peniche, the crew from Hafskip (Joost & Ilse) and Dingo (Martin, Boez & Dirma ) were also in port. We all decided to go into town and get take out Frango de Churrasco or "flat chicken" for dinner and eat it in the park one evening. 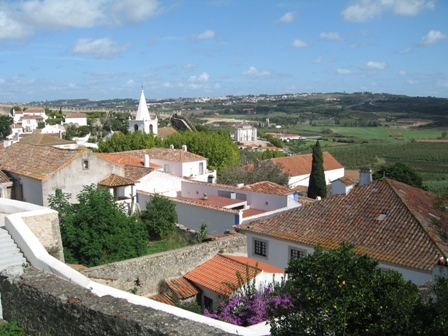 A 45 minute bus ride inland from Peniche brought us to Óbidos, a town enclosed within 14th century castellated walls. Until the 16th century the town was an important port, until the river silted and the town became landlocked. The town has been restored, and building ordinances forbid any satellite dishes or antennas to be mounted along the picturesque rooftops. One day sailing south brought us from Peniche to Cascais. 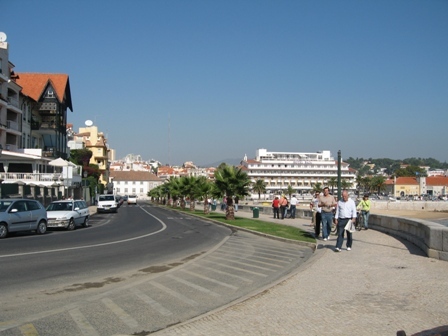 Cascais has been described as the San Tropé of Portugal. 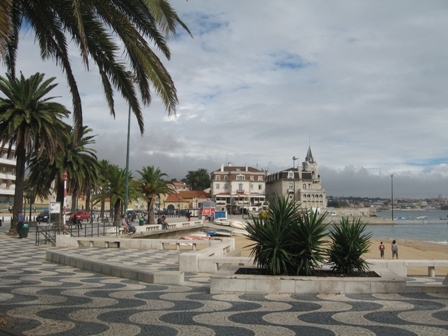 It is a beautiful resort town just outside of Lisbon, popular with the jet setters. The marina is large and modern, and was completed in 1999. It affords great protection against the surging seas just outside. When we arrived in the marina we arrived too late to get a slip so we spent the night on the guest pontoon. That evening after dinner I kept hearing the sound of running water. I got a little nervous thinking that the diesel that we just filled up with was leaking or that we had ruptured a hose. I checked the engine room, bilge, lifted the floor boards and could find no evidence of a leak. We later found out that almost everyone did they same thing when they came in and what we were hearing was the sound of Gray Mullet fish sucking the algae off the bottom of our boats. All of us cruisers are on a budget but that doesn't stop our extravagant cravings. 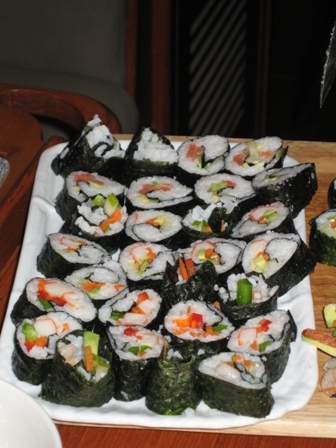 Ylva and I were craving Sushi but it was quite pricey so we decided to make our own. Neither of us had done it before but by the end of the evening they were looking pretty good and I have to say tasted even better!!! As the jet stream dipped unusually far south, the coast of Portugal was subjected to an increase in the number of storms and depressions, that would otherwise be shunted to the north of Ireland and Scotland. 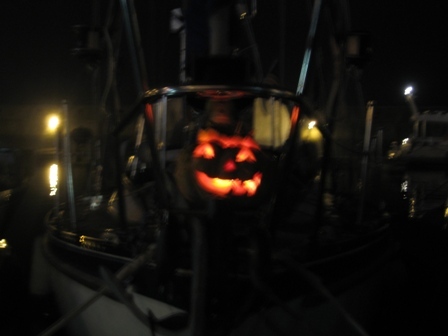 We, along with several other boats, were storm-bound in the harbor until the weather pattern improved. Who would have thought that it would take more than 3 weeks! 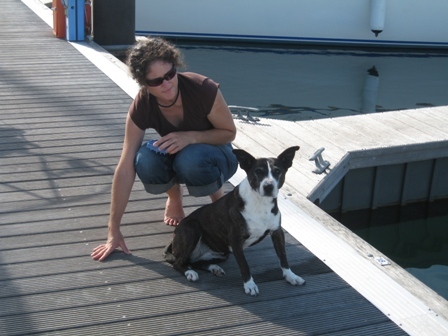 Weather updates were a frequent topic of discussion on the dock. Here Tim (Australia) shares his latest weather charts from the web with Ed (USA), Jonas (Sweden), and myself. 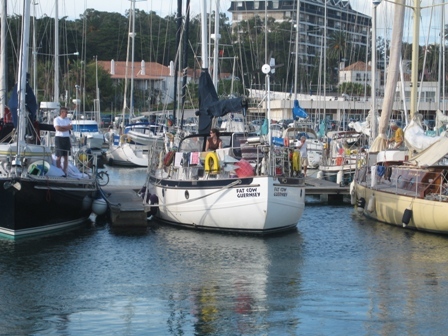 Cascais, was actually the first place where we have met other American sailors, since the Azores in June. Ed and Julie from the ship Cinnabar. They were the first American boat we had seen since Falmouth. 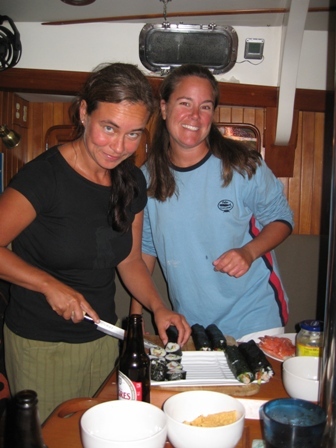 They have been cruising all over the world for the last 10 years. 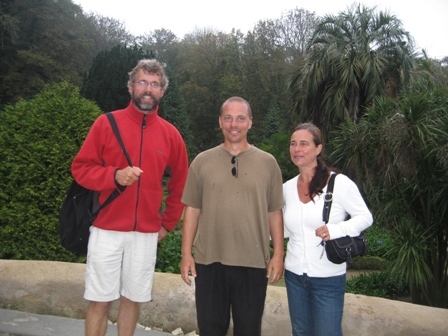 We ended up getting to spend quite a bit of time with them in Cascais and we hope to see them again in the Carib. 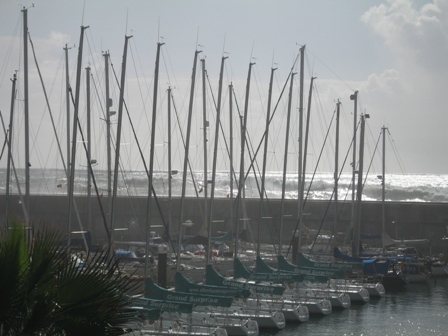 Large breaking waves against the seawall send a salty mist over the moored cruiser fleet. Halloween did not go unobserved. Holly carved a pumpkin for an impromptu dinner party, which our hostess Naomi magically turned into delicious pumpkin pie the next day. 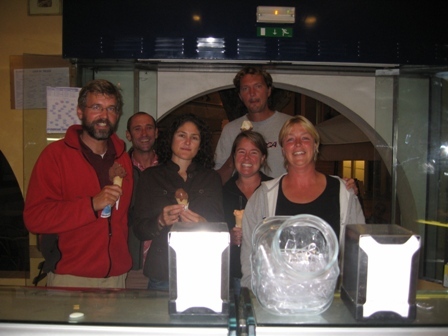 Ice cream after dinner with our friends Tim & Naomi (Australia), and Edo & Marieke (Holland). 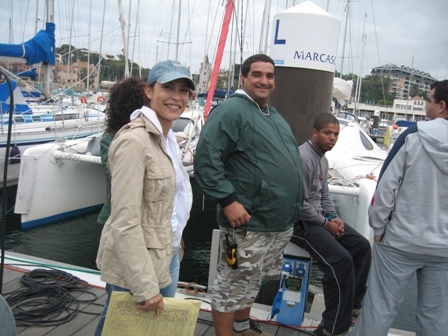 We were treated to the filming of one of the Portuguese soap operas on the boat diagonally across from us. It apparently was a romantic scene ending with some disagreement. 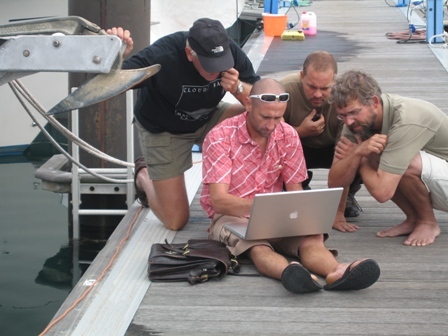 One of the crew had just finished a documentary of the Azores, which seemed more interesting. Edo, from the boat next to us, was kind enough to have a look at our masthead while he was up inspecting his own. Now lets see, windex, navigation lights, anemometer, roller furler. Huh? Where is the VHF antenna? We had lost the stainless whip off the antenna base. Glad we found this out in the Lisbon area where there are excellent supply facilities. 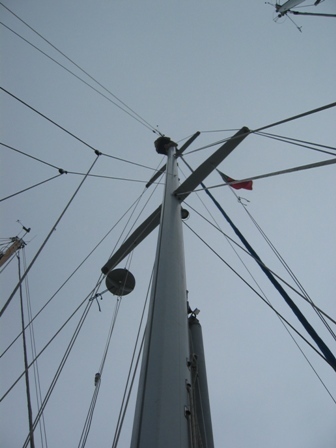 After a visit to an antenna shop which took a 45 minute train ride to Lisbon, and two trips up the mast, we were in good shape again. A masthead view of the differences in boat designs between our double ended Tayana 42 CC and the Standfast 43S. 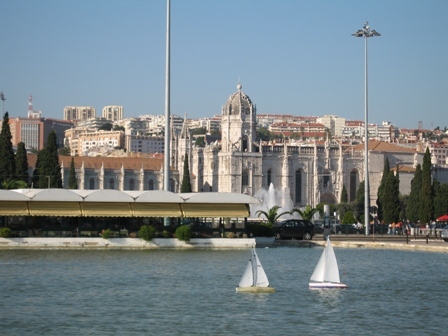 The capital city has a population of 550.000 people with the greater Lisbon area counting about 2 million people. Due to a major earthquake in 1755, the city's architecture is primarily 18th century. The rich nautical history made this a particularly interesting city. Palácio de Belém, known as the Pink Palace was build as a royal summer palace in 1559, and currently is the residence of the President of Portugal. 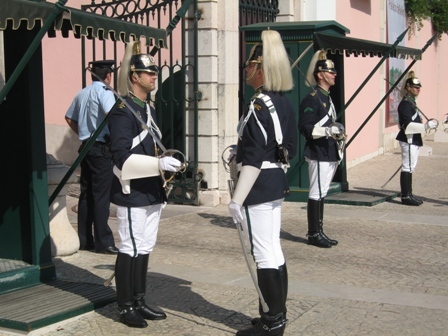 As we were walking down the street, we witnessed the tightly orchestrated changing of the guard on a particularly hot day. 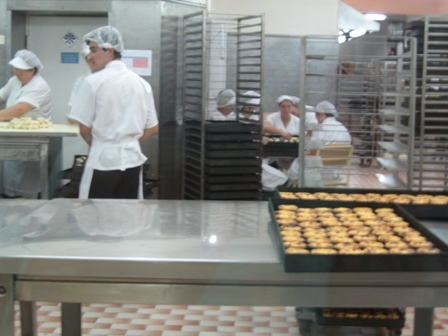 Antiga Confeitaria de Belém is a 19th century café know for their flaky pastry cups with custard, pastéis de Belém. 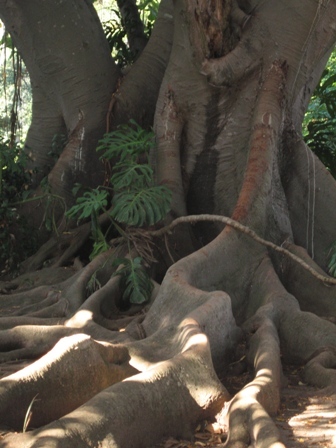 Jardim Agrícola Tropical: Once part of the gardens of Palácio de Belém, thosands of exotic plants and trees from around the world are on display. 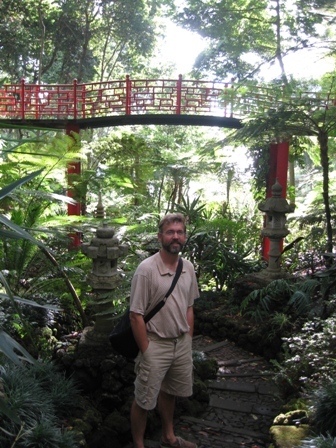 A botanical research center is also associated with the gardens with an emphasis on rare tropical and subtropical plants and trees. 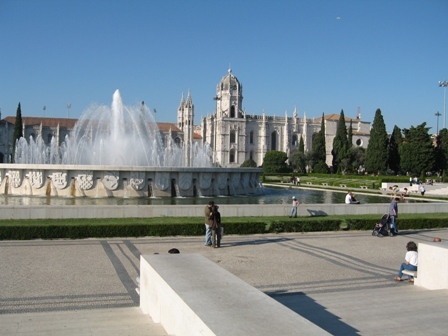 The fountains of the Praça do Império in front of the monastery of the Jerónimos. 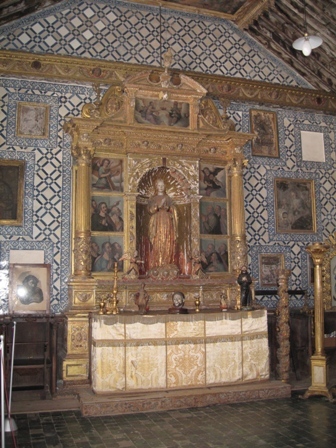 The monastery was commissioned by Manuel I around 1501, after the return of Vasco da Gama. The building was financed by "pepper money" which was a tax on the spices, precious stones, and gold brought in from the new world. 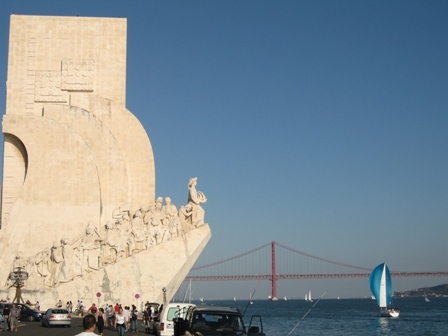 The monument to the discoveries was build in 1960 to commemorate the 500 year anniversary of the death of Henry the Navigator. It is designed in the shape of a caravel, with Henry the Navigator standing at the prow. 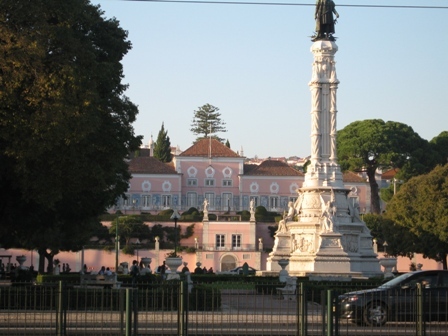 On the sides are stone statues depicting Portuguese heroes associated with the age of discovery in the 14th and 15th centuries. On the east side, Afonso V (1432-1481)patron of the first explorers, Vasco da Gama (1460-1524), Pedro Álvares Cabral (1467-1520) discoverer of Brazil, Fernão Magalhães who crossed the Pacific in 1520-1521. 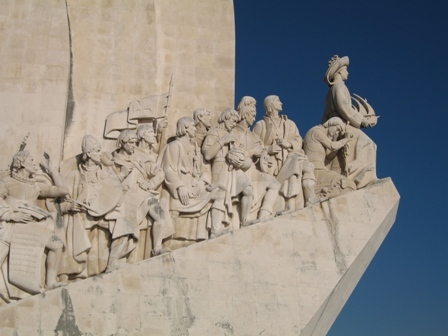 On the western side shown in the picture is Dom Manuel I holding an armillary sphere, the poet Camões with a copy of Os Lusíadas, the painter Nuno Gonçalves with a paint pallet, as well as several other famous navigators, cartographers and kings. Model sail boats in the pond between the river front and the monastery. 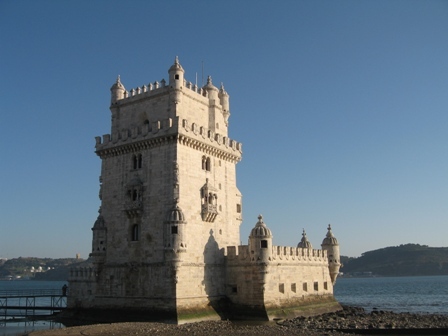 Torre de Belém build as a fortress in the Tagus in 1515-1521. We took an inland bus excursion from Cascais to Sintra, which lies on the beautiful granite slopes of Serra with our friends Ylva and Jonas on Lena, from Sweden. 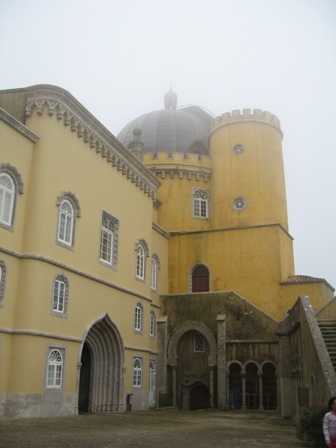 We walked to the highest peak of Serra de Sintra where the Palácio da Pena is located, as was the case with our visit, it is also often blanketed by a misty veil. King Dom Fernando II (cousin of Prince Albert who was married to Queen Victoria) was a patron of the arts, and a watercolor painter. He appointed German architect Baron Von Eschwege to build his summer palace. It was build on a Hieronymite monastery dating from the 15th century. The palace was not completed until 1885, the year that he died. It is painted in the original daffodil yellow and strawberry pink. 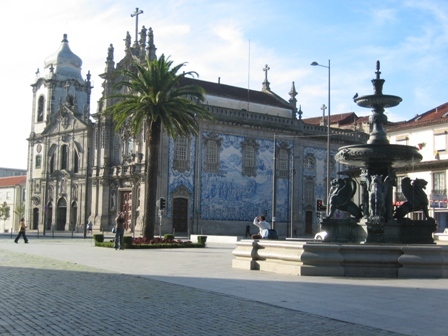 With the declaration of the Portuguese Republic in 1910, the palace was converted to a museum. 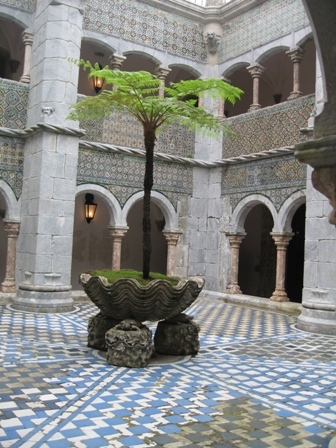 The cloister pictured on the right, is part of the original monastery building, decorated with an intricate tile work. 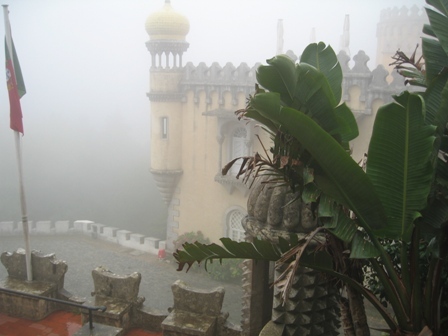 A fairy tale view of the palace on the misty mountain. 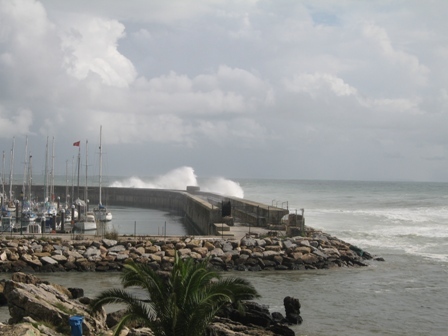 The waves breaking along the breakwater outside Cascais Marina. 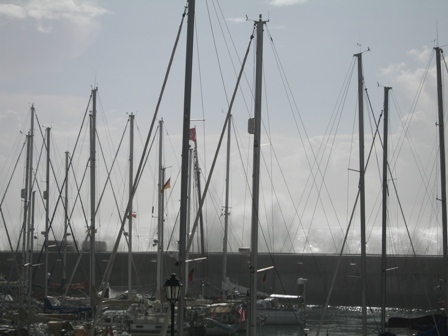 We experienced strong southwesterly winds for a solid 3 1/2 weeks, making it impossible to sail to Madeira to meet Marco's parents. When planning this trip Marco and I made a point of not making any promises of where we would meet our friends and families. 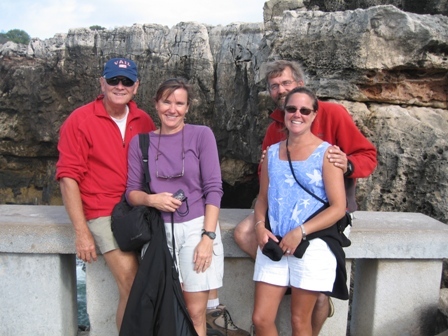 A tight schedule on a trip like this can only make it easier to make bad decisions, to have to sail in unfavorable weather, etc... We did plan on trying to meet up with John and Tina, Marco's parents, in Madeira however. We figured we had almost a month to get a 4 day weather window that would allow us to sail to Madeira. 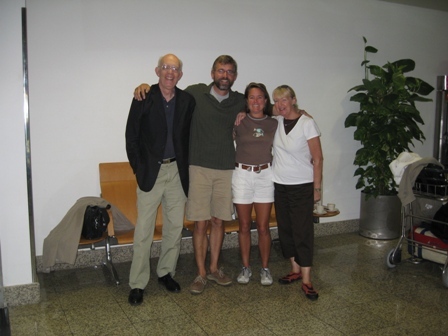 Those 4 days never did occur during the entire 3 1/2 weeks before we planned on meeting them, so we decided to fly out of Lisbon to Madeira instead to see John and Tina. We had a fantastic time!!! It was a completely different feeling landing at Madeira airport than actually doing all the work yourself in getting someplace and it actually felt like a mini vacation. Marco and I didn't get into Madeira until 1 am but John and Tina were up waiting for us at the hotel that we were all staying at. Not only were they waiting they had a entire party planned, including a nice bottle of wine, fruit, nuts and a beautiful bouquet of Bird of Paradise flowers. They thought of almost everything - they just forget the wine opener. Desperate times call for desperate measures, so Marco took a screw out of a door hinge in the room with a butter knife and used the screw as a wine opener!!! The party was saved. 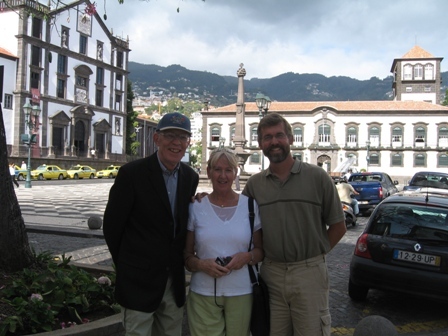 The next morning, John and Tina gave Marco and I a tour of Funchal. Since they were there a day ahead of us they already had a feel of the place and were great tour guides. 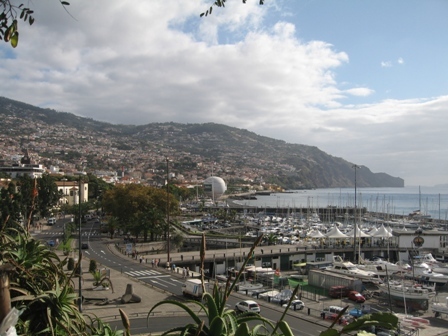 This is a view of the harbor located in Funchal. Here Tina is checking her email. In many of the harbors in Portugal there were free WIFI areas in the parks and main sitting areas. This was the first time that we actually came across a place that also provided the computers to use for free. John, Tina and Marco in front of the Praça do Município where contrasting black and white stones pave the square. This is also where we found our favorite restaurant for lunch. 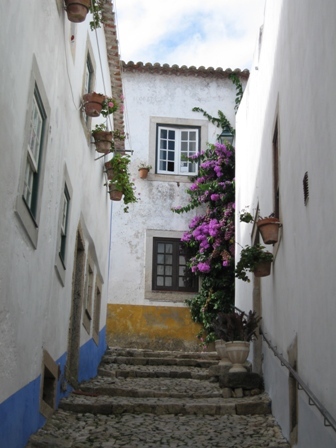 This picture is take along the Rua do Aljube, alongside the Sé, where flower sellers wear traditional costumes as they sell their exotic flowers. 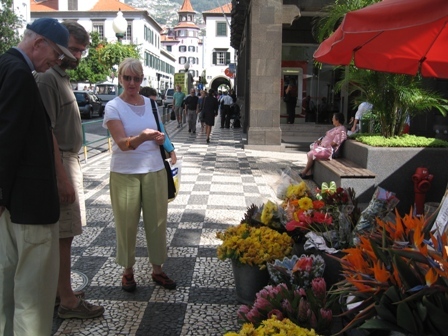 The Mercado dos Lavradores is where the flower growers, basket weavers, farmers and fisherman from all over Madeira bring their products to market. 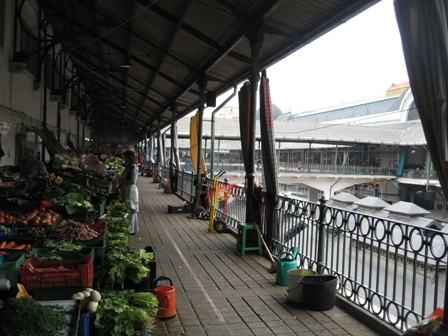 This is a covered market building 3 floors high that surround a open courtyard in the middle. Stall owners in the Mercado dos Lavradores offered us slices of mango, custard fruit and many other types of fruit that Tina and I had never seen or tasted before. 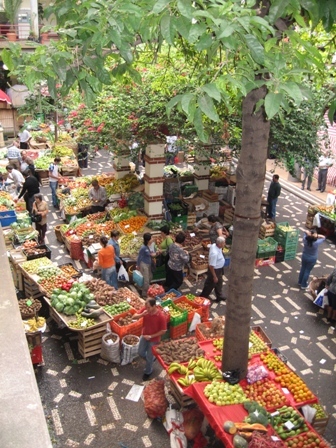 We ended up buying a sample of all different kinds of fruit and had them one morning at the hotel during breakfast. John checking the time, "is it even noon yet?" 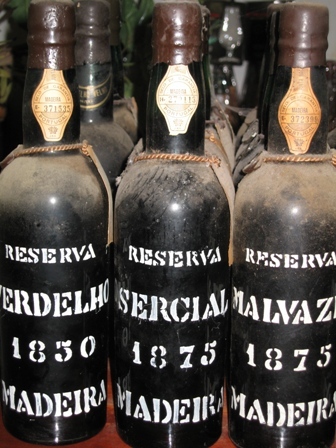 Vintage Madeira from every decade as far back as the middle 19th century is still available for sale. The oldest surviving bottle of Madeira dated from 1772. 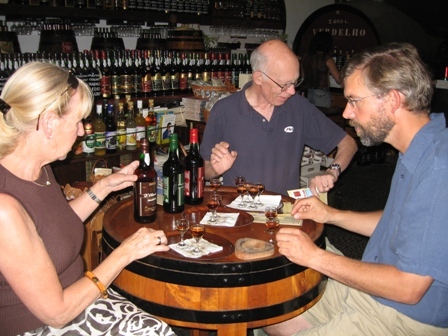 A trip to Madeira is not complete if you have not stopped in one of the many wine lodges where Madeira wine is made and sold. From the middle of the 16th century, ships would stop at Madeira and take on barrels of some of the local wine, which helped sailors avoid scurvy due to the high vitamin and mineral content. After the end of a voyage that took the sailors south of the equator they noticed that the wine from Madeira actually tasted better once it was heated by the tropical sun. 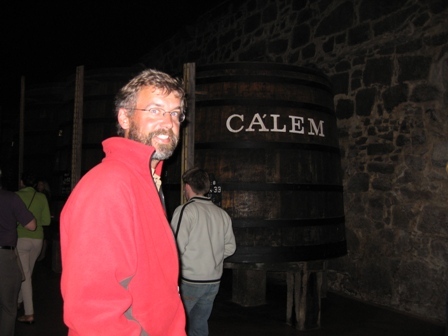 By the 18th century, it became a common practice to warm the wine from Madeira while making it using a process called, estufagem. 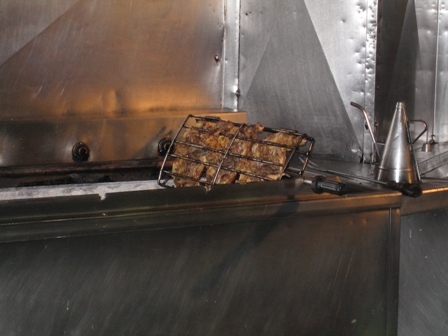 The Madeira is "cooked" for 6 months using the heat from the sun and also assisted by pumping hot water through pipes. 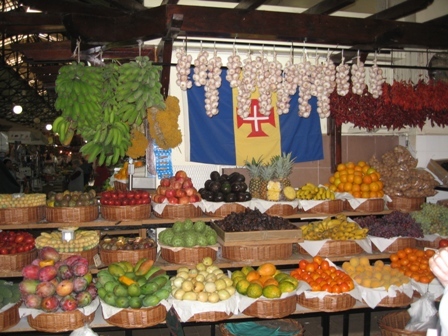 A Madeira will typically spend these 6 months at temperatures of 40-50°C (104-122°F) before it is fortified with brandy. Once we left the wine lodge Tina and I thought it only fitting that we visit the Convento de Santa Clara. You had to ring a bell, then one of the nuns would let you in and give you a tour. 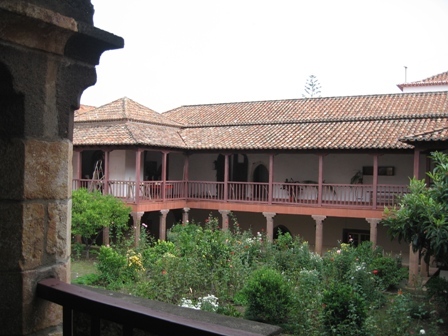 The Convento was founded in 1496 by João Gonçalves de Câmara who was a grandson of the founding father of Madeira, João Gonçalves Zarco. The courtyard of Convento de Santa Clara. It was truly amazing to visit this convent. There were many priceless religious artifacts everywhere just displayed out in the open. It gave you the feeling like this is what it has looked like since the 15th century. They even had paintings dating from that era hanging in the main church area. 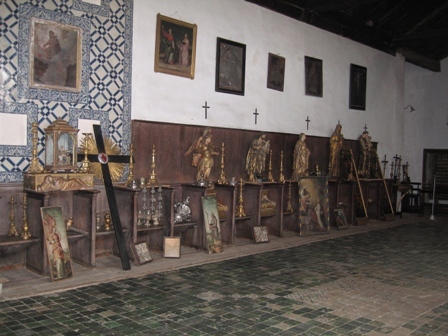 They also had a collection of precious 17th century azulejo tiles that covered many of the walls in the church. The four of us also took a tour of Quinta das Cruzes, where it is said that Zarco, the man who claimed Madeira for Portugal, first built his house. The mansion that is there now houses a Museum of Decorative Arts and is furnished as if a wealth merchant lived there. 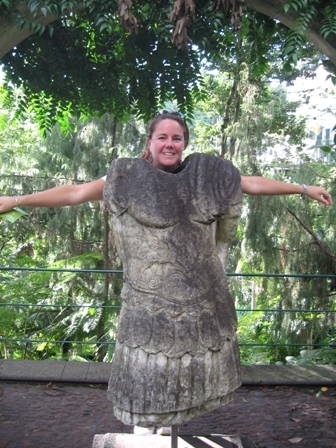 The garden outside is dotted with ancient tombstones and architectural fragments. Marco and I decided one afternoon to take the cable car up to a hilltop town called Monte where we hoped to hike further up to the top the hill so that we could see the other side of the island. We followed a levadas on our hike, which is a unique irrigation system that enables the plentiful rainfall on the north of the island to be distributed to the dry, sunny south. The levadas are narrow channels that carry the water long distances to the banana groves, vineyards and market gardens. 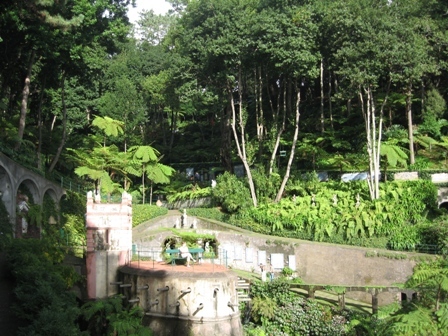 All together there were 2,150km (1,335 miles) of canals spread over Madeira and some of them date back to the 1500's. 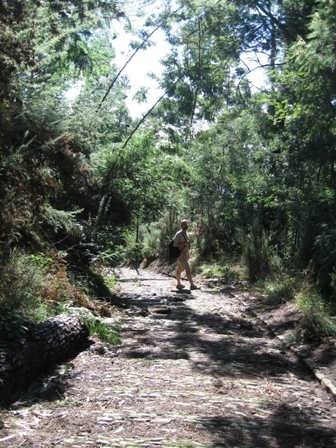 Maintenance paths ran along side the levadas which provided us a great foot path to follow. This is the view that we got once we reached the top of the hill. Madeira actually means wood this picture shows some of the thick wooded areas present on the island. 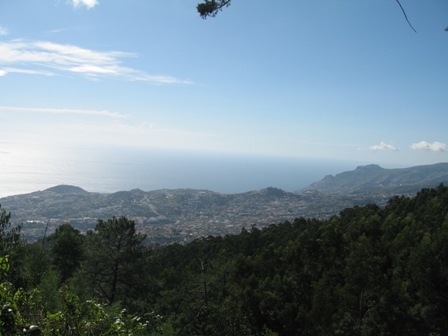 The volcanic peaks which form Madeira rise sharply out of the water and many of the mountain tops reach 1500m. 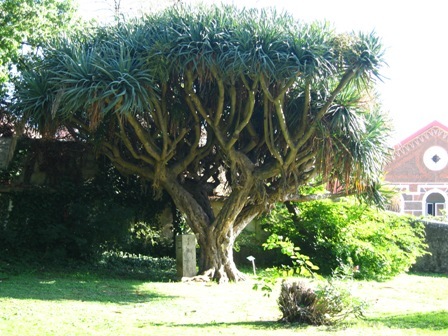 Unlike the Azores, Canaries and Cape Verde islands however, Madeira does not have a individual giant of a mountain. This accounts for when we reached the top of the mountain all we could see were more mountains. The view was never the less quite spectacular. 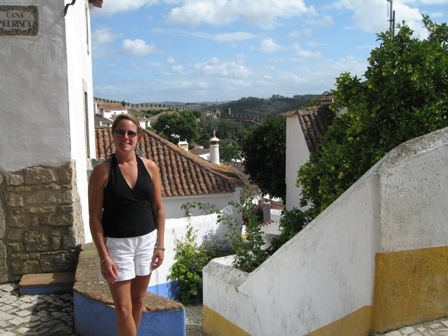 Hiking back down to the town of Monte we came to the church of Nossa Senhora do Monte. 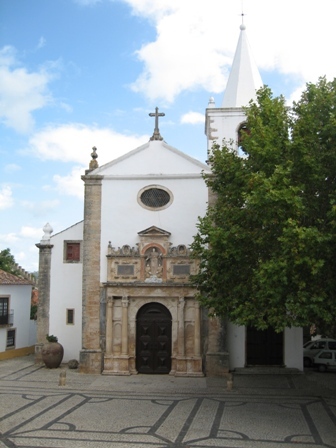 This building was built in 1818 on the site of the first chapel that was built here in 1470, by Adam Gonçalves Ferreira. 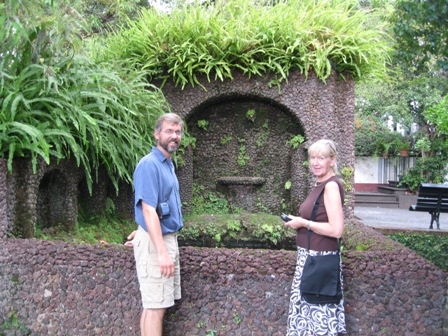 Adam and his sister Eve, were the first children to be born on Madeira. 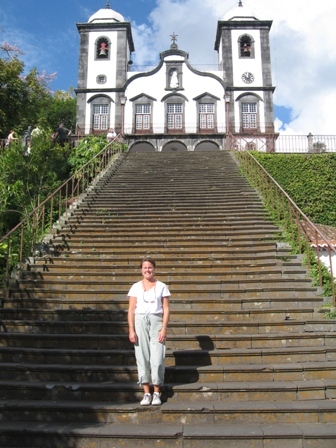 The Virgin of Monte is Madeira's patron saint and this church is the focal point of the pilgrimage that takes place every year when penitents climb the churches 74 steps on their knees, OUCH!!! Being goofy in the gardens. 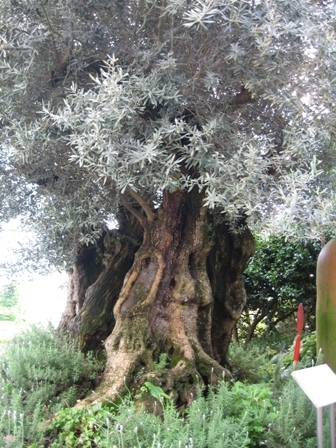 "This millenarian olive tree was planted by the Romans in about 300 bc. The Romans were already harvesting olives from this tree before the miracles of Jesus occurred." 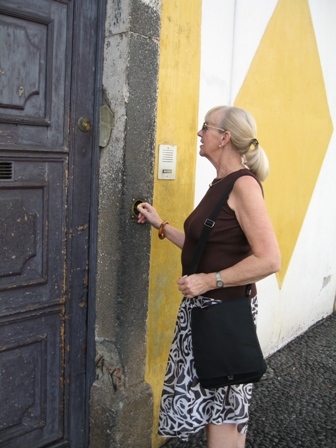 Once done touring the gardens of Monte it was time to head back to Funchal where we planned to meet John and Tina for a night of Fado. We had 2 options of how to get back down the mountain, the cable car that we took up or one of these wicker toboggans. 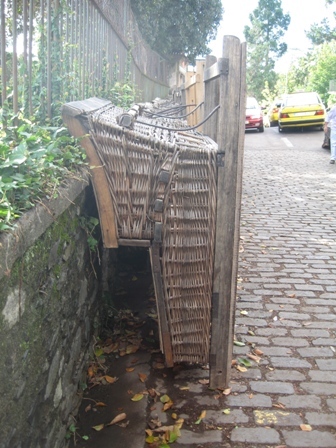 These Madeiran toboggans were invented in 1850 and used a form of passenger transport. 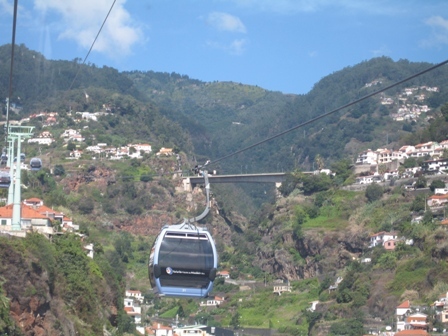 Toboggan drivers push and steer these carts from the back and they use their rubber soled boots as brakes The decent from Monte to Funchal in one of these covers 2km (4 miles) and you reach the bottom in 20 minutes. 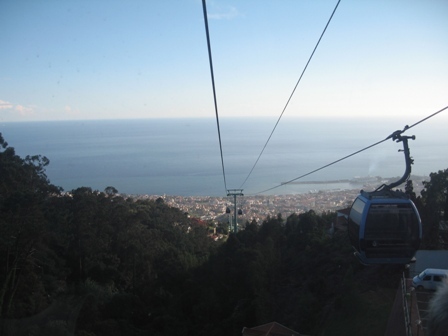 Marco decided that this option was too dangerous so we went back down in the cable car. Later that same evening John and Tina treated us to a night out where we ate delicious regional seafood and got to listen to Fado music. Fado music is a lot like the blues in the essence that it is an expression of longing and sorrow. 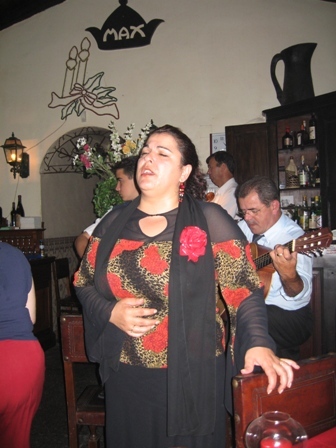 Fado literally means fate and the term can be applied to an individual song as well as the genre itself. The music is based on the concept known as saudade, which means a longing both for what has been lost, and for what has never been attained. Maria Severa (1810-36) was the first great fadista and is also the subject of the first Portuguese sound film in 1931. Her life was filled with scandal and she died a very early death, all which are pivotal to Fado history. 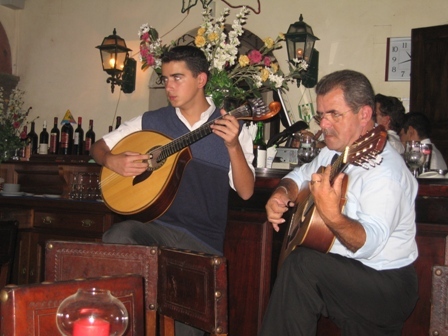 The boy on the left is playing a guitarra, which is peculiar to the Portuguese culture, and is playing the melody and will occasionally play a solo. The viola player on the right provides the rhythm accompaniment but will never play a solo in Fado. 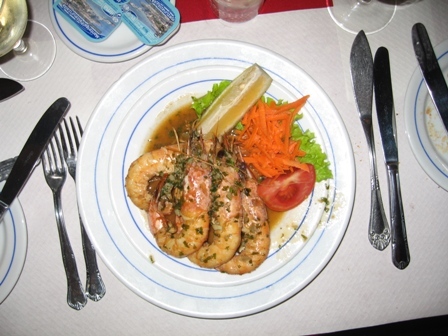 Gambas con ajoili (shrimp with garlic), one of my favorite dishes. 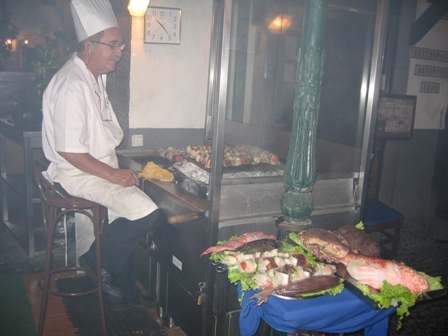 Here our chef is grilling our seafood kabobs over a wood fire. The four of us at the airport saying goodbye. We had such a great time with John and Tina and we can not thank them enough for coming out and seeing us on our trip. We might not of sailed to Madeira but this stop will certainly be one of Marco and mine favorite, thanks to John and Tina. We love you guys!!!! 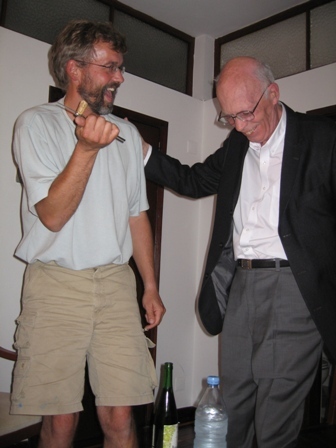 By the way, John is the one that relays our daily positions of longitude and latitude that we send via satellite phone to all of you via email. After spending over 3 weeks in Cascais a four day weather window finally occurred and we decided to leave for Porto Santo, in the Madeira group of islands. It was tough to say goodbye to our good friends from Australia (via England), Naomi, Tim and of course Orbie aboard Fat Cow. 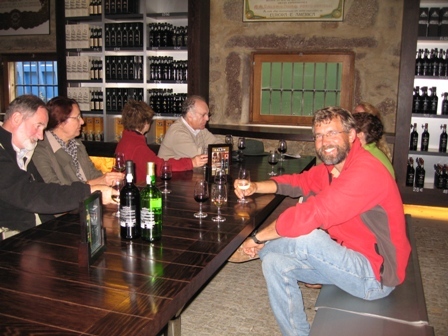 We actually met Tim and Naomi in Peniche, in the internet café. We later met them one night for drinks there and we came home with sore cheeks from laughing so hard. Marco was telling Tim and Naomi about his plans if he met up with pirates underway and how to tell if the boat is a fishing boat or just plain trouble. Marco told them that he would throw Molotov cocktails at the pirates if need be. Marco also told of the conversation that him and I had one day sailing as we were watching a fishing boat that did not have a name on the side, that he had to explain to me how to make one. Well, Tim and Naomi thought that just summed up being an American, everyone has firearms and weren't afraid to use explosives. From there the conversation went down hill fast and we all had a night filled with laughs. We didn't expect to see them again once we left Peniche, because they were planning on wintering in Peniche, so when we left we said our goodbyes. Well, a week or so later in Cascais, I returned to the boat after taking a shower and sitting in the cockpit what do I find but a Molotov Cocktail. I knew it could only mean one thing, Fat Cow was in Cascais. Sure enough, Tim and Naomi came in during the night and were docked a few boats down from us. It was so fun hooking back up with them again, having a Halloween party where Tim made spicy shrimp and homemade bread, going out to dinner, and laughing some more. We hope to hook up with them in the Carib or in the US in the near future. Naomi aboard Fat Cow, saying goodbye as we left Cascais.